In time there will be plenty of opportunities to provide thorough contextualisation and analysis of the new Kachin war in northern Burma’s Kachin State and Shan State. 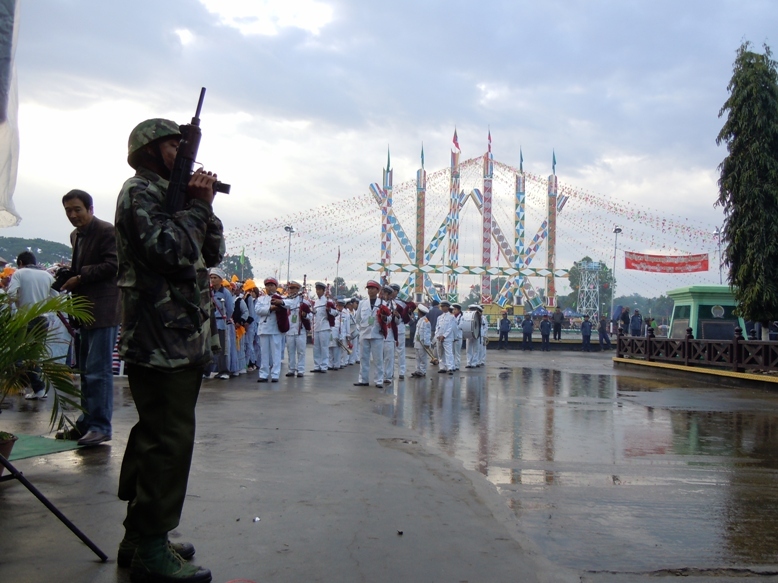 Starting with this one, here at New Mandala our Kachin-related posts from 2011 have made small contributions to understanding what has been going on. Now, in the first week of October 2011, all of the attention has, quite rightly, focused on President Thein Sein’s audacious decision to suspend the construction of the Myitsone mega-dam project. This is the Chinese-backed hydro-electricity project being built at the confluence where the Ayeyarwady River begins. The project has never enjoyed popular support among the Kachin and a long-running campaign against the dam, originally confined to Myitkyina, has spread to other parts of the country. Aung San Suu Kyi is now also involved. But there is something else which I think deserves to be highlighted if we are serious about getting a useful picture of the political and security dynamics in northern Burma right now. Since the war between the Kachin Independence Army (KIA) and Burmese government forces re-ignited on 9 June 2011 there have been a large number of battle reports, many of which filter out to the rest of the world through the Kachin News Group. From these sources we learn that in a single day of fighting earlier this week the KIA claims to have killed 40 government troops with no losses on its own side. Taken on its own this would be remarkable. But — as best we understand the long-term combat losses sustained by Burmese government forces — these numbers fit a months-long trend. As I have remarked previously, there have now been a number of engagements where the KIA claims to have killed dozens of Burmese soldiers. My observation is that the total losses on the government side could now, by my count following the published KIA numbers, be approaching 500 soldiers killed. The KIA has suggested that the number is even higher. How reliable are the KIA numbers when it comes to Burmese government combat losses? How would we know? Are there smart ways of triangulating information about combat losses in a situation where all information is imperfect? If the Burmese government is losing so many troops in battle what impact does that have on their forces in terms of combat readiness, unit cohesion, command resilience, etc? Assuming that the KIA reports are largely correct, do Burmese government commanders see value in making tactical or strategic adjustments to help minimise future losses? The Burmese government almost never reports its own losses. Do senior military commanders (especially those based in Naypyidaw) have a good appreciation of what is happening to their troops in northern Shan State and eastern Kachin State? More provocatively, would they consider these reported losses unduly problematic if they are chalking up small victories along the way? If the numbers are reliable, what are the impacts across Burmese society from losing so many government troops so quickly? We should remember that almost all of those who die are relatively young and drawn from the junior ranks. They all have family and friends who will miss them. How are funerary arrangements managed? Are the bodies of slain Burmese soldiers returned to their families for cremation? What understanding of these combat losses filters through to Burmese society as a whole, or to the wider Burmese army system? How long can a Burmese Army Regional Command, or Special Operations Command, sustain this reported level of combat losses? Experiences from the Karen State, and elsewhere, suggest that the Burmese government is prepared to take heavy losses if there is a chance of grinding guerrilla opponents into the ground. But just have a look at the publicly reported information on combat losses from Karen National Liberation Army (KNLA) engagements. They tell us that in the first 6 months of 2011 the Burmese government saw 740 of its troops killed with 998 wounded. The KNLA claims that only 8 of its fighters were killed and 8 wounded during the same period. These are mind-boggling ratios; almost unbelievable. Is that the way the war with the KIA is headed and, if so, how long can it last? Any answers from New Mandala readers — or even just general suggestions or related queries — are, of course, very welcome. As I noted back in September we are now coming into the time of year when the rain stops falling in northern Burma. For both KIA and government strategists this has significant implications. There is much to ponder. The SPDC losses are believable. Conscripts in the SPDC are poorly trained, poorly equipped, and poorly led. I’ve spoken to many KA and KNLA soldiers who told me that the SPDC conscripts were a sorry bunch, with the exception of their artillery and mortar units, who are rated as very good. Insofar as repatriating their dead to the families – rarely happens. An officer in the Karenni Army related to me that after an attack on his compound was repulsed with heavy SPDC casualties, the dead were left to rot where they lay. He stated that it stunk for weeks. In battle, the Kachins, Karen and Karenni have home court advantage. Additionally, their morale is much, much higher, as they’re fighting for their homes and way of life. The average SPDC conscript doesn’t have the foggiest idea as to what he’s fighting for. Demonize the unpopular side with a deserving “less than Human” existence, in Intelligence, passion etc. All the brothers within are dying from fighting for the left over scraps because of “The west useless careless policy”. And here you are describing the ugliness of the present quagmire as though do not contribute to. In the coming dry season the inevitable 4 cuts strategy will be employed by this government. What are the historical facts on Bamar and Kachin/any ethnic contentions? How has the policy of the west contributed to the continuation of ethnic strives within Myanmar? How come no UN effort what so ever to mediate any of these unnecessary blood letting yet plenty peanut gallery posters as well as HRW making hay out of the tragedy? I agree the statistics stretches credulity even if it’s true. Reminds me of the late KIO chairman Brang Seng, the former headmaster, who apparently did the math and came up with this argument in favour of peace talks thus in 1980 – say even if one Kachin managed to kill ten Burmese, when all the Kachins died fighting there would still be 20 million Burmese left. Dry season military campaigns are customary for obvious reasons in a climate governed by the monsoons. When they reckon they’ve dealt adequately with the Kachin, the generals will turn on the Wa, more likely if the current upset over the Myitsone Dam triggers a genuine fallout between Beijing and Naypyidaw, better still if they succeed in wooing the West. As for the Burmese dead, whilst cremation is customary for violent deaths, Buddhist tradition discourages any attachment to the physical remains and funeral rites can take place without any. Wherever possible cremation may take place on the spot and the ashes will be returned to the family. I can certainly see that many of those killed in combat would be either left on the battlefield (due to the danger of retrieving bodies) or hastily cremated nearby. Moe Aung, it would be interesting to know more about how this is managed. In Thailand, at least, there are now very heavily codified ways of handling the bodies of those killed in combat. The level of care taken tends to increase with the rank of the deceased. Perhaps some of our readers with good tatmadaw connections can offer pointers on exactly how these matters are dealt with. It would be especially interesting to hear about any differences in the treatment of officers who are killed on the frontlines. Hope Hla Oo can help in this matter. He has himself seen action against the KIA in the 80s. I’d like to hear what he has to say. Today’s report from the frontlines in the northern Shan State once again details a KIA ambush of Burmese troops. While no figures are included, it does give a sense of the style of combat that the KIA is pursuing. And, according to such reports, they seem to be doing their utmost to minimise their own losses. In the context of these recent insights the ongoing reporting from the KIA will need our continued attention. In WWII the Kachins killed 25 Japanese for every one casualty they suffered. These reports seem to beat even that number and are pretty hard to believe. I think a more pertinent question is how is the fighting being reported on the Burmese side? I don’t expect any casualty figures for the army, but surely there has to be some reports in the New Light of Myanmar of rebels seeing the light and returning to the legal fold. That’s right. And everyone in the Kachin State that I have ever asked continues to conjure up those World War II ratios to clarify Kachin martial prowess. I wonder if the legend of those ancestral Kachin warriors infuses the approach to reporting combat taken by the KIA today. If today’s fighters couldn’t match their forebears then there would be questions. As for the New Light, my two summaries of coverage (here and here) are probably the easiest places to start. NAY PYI TAW, 3 Oct-An explosion occurred near the fence of staff quarter in Myitkyina of Kachin State yesterday night, killing a male stranger. Due to the sound of blast that turned out near the fence of staff quarter in Thida lane, Thida Ward of Myitkyina at about 7.55 pm, a team led by the head of Kachin State police force rushed to the scene where a stranger aged about 30 and assumed to be an insurgent was found dead. According to findings in the immediate vicinity, the mine went off while the man was activating it and he who was trying to cause public causalities and panic with villainous desire was killed. The case is under investigation to expose further details. NAY PYI TAW, 2 Oct-The International Day of Older Persons of Kachin State was observed at Sasana Beikman in Myitkyina yesterday. Kachin State Chief Minister U La John Ngan Hsai and the speaker of Kachin State Hluttaw presented gifts to older persons. The Chief Minister attended the 47th Anniversary of Myanmar Police Force at the town hall in Myitkyina. Commander of Kachin State Police Force Police Col Myint Lwin read the message sent by the MPF Chief. Later, the Chief Minister, the Speaker of Kachin State Hluttaw, the Kachin State Chief Justice, the Kachin State Security and Border Affairs Minister, the State Advocate-General and the Commander of Kachin State Police Force presented prizes to outstanding police members. NAY PYI TAW, 25 Sept-KIA group opened fire with small arms and threw grenade at Sadon market in Sadon Sub- Township of Waingmaw Township, Kachin State, at about 3 am on 22 September. In the scene, Daw Ma Shi Kawt, 43, (daughter of U Phaung Mya Labyin) of Ward 5 in Sadon Sub- Township was injured at the body below the armpit by the gunshot and while receiving medical treatment at the hospital, she died of the wound in the afternoon. Not only local national races in Kachin State but also all the people in the entire nation hope KIA group to return to the legal fold to join hands with the local people for serving the interests of the Kachin State and the Union and they do not want it to commit the destructive acts such as committing mines attacks to destroy roads, forced recruitment in villages at gunpoint, collection of extortion money, disrupting State’s projects, killing one another and planting mines at areas frequented by people. Moe Aung is correct in stating that even with a kill ratio of 10:1 the SPDC will still win. I read one article that stated that the KNLA was killing SPDC troops at a ratio of 25:1 and perhaps as many as 35:1. I was told on separate occasions by two different KNLA colonels that the SPDC was taking incredible losses, but continued to advance. They know that the numbers are on their side. The KNLA has perhaps five thousand troops, not all of which are in the field at one time. They don’t have the weapons and ammo to field all of their forces at one time. As far as the SPDC goes, I believe that it was Stalin who said that “quantity has a quality all its own”, and that’s what we’re seeing here. As an aside, the Karenni Army has just over 1500 men. They’re pretty much pinned against the border, and the SPDC is content to let them sit in their mountaintop camps. Any large engagements will between the SPDC and the Kachin or the Shan State Army – both groups can mobilize large numbers of well equipped troops. The Kachin are fighting for home and hearth like Charles F said earlier. They’ve made use of the ceasefire years gainfully like the Wa too (an opportunity the Karen denied to themselves rightly or wrongly), and are better trained, equipped and prepared for the fight this time round. Nonetheless it is difficult to envisage these numbers unless the Tatmadaw has used human wave tactics like the Wa did in the 80s under the CPB commanders when the northeastern front for the Tatmadaw was almost like the Russian front for the Germans in WWII with govt troops taking very heavy casualties. Even with the news blackout as far as govt casualties are concerned, word tends to filter out from friends and families. The congenial Burmese in the main are not in the habit of keeping secrets. Hla Oo’s input here as a veteran of the KIA war in the past would be much appreciated. Those New Mandala readers following these issues will want to see the most recent KIA battle reports. The details are here and here. Both episodes of combat seem to have left large numbers of Burmese troops dead. Notorious to deal with Kachins who are perfect hunters by born. As a Kachin man, I know how the Kachins maneuver the jungle warfare which can noway be understood and managed by the plain dwellers. The Kachins feel bitterly that they have been repeatedly cheated and enslaved, they firmly believe that their rights can only be brought by fighting and choose to die instead of living under the brutal inhumane regime. We Kachins had to sign the Panglong to join the Bama to set up the Union in parallel because we were independent separate Nation before the Union of Burma, we were never under the Burmese Kings, we even did not know the name Bama, we imitate later from Chinese and Shan and call them Mien. We had our own war with the British and occupied by the British only in the beginning of 20th Century. If we were not independent Nation, Aungsan did not need to invite us to sign the Panglong agreement, just signing with British would be sufficient. We were denied our rights, our land has been ransacked to the ground by Bama and his Pawk Phaw Chinese. We have no options left but to grab the guns, if no bullet, we will use our knifes and barehand. No body would win this war, but the kachin and all other ethnic people and Barma people are loosing their love one for the seek for Generals in Naypyidaw. Four cuts policy are already in place. We need International urgent responses. As Zarganar just said, ‘NATO’ No Action, Talk Only and Wait and See policy from the International communities would not help either. That is very useful. Thanks for sharing. As you say, this proves one of the accounts provided by the KNG and others. As a warning to New Mandala readers I should note that there are parts of this video which are very graphic and confronting. But for those wanting an impression of the current war between the Kachin Independence Army and Burmese government forces it is a good place to start. There are quick discussions with tatmadaw prisoners; surveys of the carnage after the ambush; and efforts to account for all of the seized equipment, weapons etc. Personal photos are also shown. New Mandala readers wanting to examine this issue in more detail will also want to look at this Kachin Independence Army battle video from the early 1990s. Senator Mitch McConnell is the leader of the Republican Party in the US Senate. There is a good chance he will become Senate Majority Leader in 2012. US has a shared system of government and Senator McConnell may dictate US Burma policy next year. High level lobbying has begun to help our Kachin Ally which is now subjected to unilateral and unprovoked attacks by SLORC/SPDC while the Burmese generals renew their ceasefire with China’s proxy army, UWSA, in occupied Burma. Like in Suharto’s Indonesia, restoration of freedom and democracy in Burma will be precipitated by anti-Chinese riots. Unfortunately, ASSK/NLD has become a NGO and cannot legally participate in Burmese politics. How about we turn all the guns in Burma on the right target – the generals at Naypyidaw? It seems the POWs were treated well by the KIA in the video. I heard someone say in Burmese, “Don’t be afraid, you’ll be alright”. I’d say that’s an excellent start. Admittedly it’s easier said than done especially across an ethnic divide, but something really worth a try is wherever possible to fraternise with the Tatmadaw rank and file, through pamphlets or simply through a loudhailer when facing each other across the trenches and bunkers. Give the Burmese troops a pleasant surprise that there is no racial hatred as such on display. Make them see the common enemy, their generals who treat their own men and their families little better than the ethnic rebels. Tell them it’s high time they turned their guns on their cruel oppressive overlords. It’s an advantage that many Kachin speak Burmese whereas most Burmese can’t speak a word of Kachin. An insurrection is in essence a struggle not so much against the army as a struggle for the army. Hopefully this is dawning on the Burman majority today. Since the Kachin are very unlikely to win this war just on purely mathematical terms (they may be able to fight the enemy to a standstill) unless they can realistically expect a Western invasion or aerial attacks on the Tatmadaw as in Libya (an even more unlikely scenario given the geopolitical position of Burma) this war may smartly and beneficially be transformed into a ‘battle for hearts and minds’ . Call it a very high risk high stake psy-ops in turning the tables on Than Shwe. If successful the numbers are no longer against the Kachin or any other minority group, or the unarmed Burmese opposition for that matter. Good luck. The KIA doesn’t have the resources to guard, protect, feed and care for captured SPDC troops. I could be wrong, but the most likely outcome after the cameras were turned off was the captives being shot into a grave that they themselves dug. Such is the nature of guerrilla warfare. For those who find that fact abhorrent, what do you think the fate is of captured KIA troops. We already know that the SPDC routinely commits gang rapes and murder. It’s a war with no rules, and no mercy. Most likely, Charles F. It’s an alternative to an eye for an eye or turning the other cheek, choose what you will. We all need to live in this land peacefully together. Do not for a moment think Burmese of any political colour, civilian or military, present and future, will find the break up of the union acceptable. Time a union of the willing replaced a union by coercion.